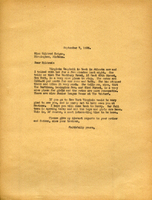 A letter to Miss Virginia Campbell inquiring about a dinner with Mrs. Hammond in New York and the possibility of a trip to New York as well. 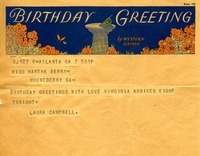 Laura Campbell sends her birthday greetings and informs Martha Berry that Virginia will arrive at 8 pm. 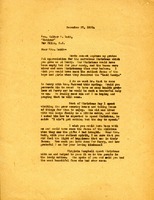 This is a set of two telegrams. 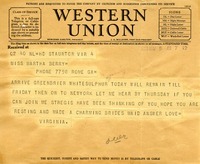 The first is from Virginia Campbell to Martha Berry, informing Miss Berry of her arrival in Whitesulphur, VA and asking if she would like to join her in going to New York. 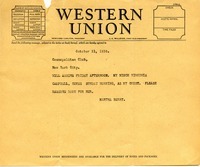 The second is Martha's reply, in which she states that she cannot go to New York because she is tired from weddings and plans to go on vacation for a few days. Miss Berry informs the club that she will be arriving Friday afternoon and her neice Virginia Campbell will be coming Sunday as her guest. She asks that a room be reserved for Miss Campbell.